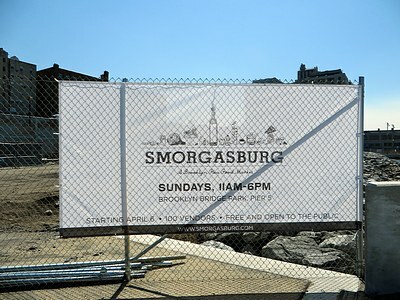 Smorgasburg is back this Sunday, April 6, from 11:00 a.m. to 6:00 p.m. at the Pier 5 uplands, Brooklyn Bridge Park. It will continue each Sunday through November 2. This (Friday, March 4) evening, starting at 7:00, Bargemusic has an interesting “Bargemix” concert featuring works by Hindemith, Yoed Nir, Jimi Hendrix, and Rachmaninov, performed by cellist Yoed Nir and friends. On Saturday evening at 7:00 there will be a “Masterworks” concert featuring pianist Olga Vinokur performing works by Scarlatti, Schumann, Liszt, Schubert, and Chopin. On Sunday afternoon at 4:00 ther is another “Masterworks” concert featuring works by Mozart, Gabriela Lena Frank, Debussy, and Tchaikovsky, performed by Ran Dank and Soyeon Kate Lee on piano. There’s more information and buy tickets here. Saturday afternoon at 3:00 there will be a free, family oriented “Music in Motion” concert. Doors open at 2:30; first come, first seated. This Saturday the Brooklyn Historical Society will present a walking tour of DUMBO, focusing on the neighborhood’s history as “a bustling harbor and an important stop for goods and people, including enslaved Africans” where “[l]ater the streets were home to those who envisioned an equal and free society.” The guide will be Suzanne Spellen, a.k.a. Brownstoner writer Montrose Morris. Tickets are $25; $15 for BHS members; reserve them here. Looking ahead to Tuesday, April 8, at 6:30 p.m. BHS will present a screening of Slavery by Another Name, which “explores different forms of forced labor after the Civil War.” Afterward, there will be a discussion led by Josh Saunders, a senior trial attorney at Brooklyn Defenders Service. The event is free, but you must reserve tickets here. The Heights Players will continue their production of Yentl by Leah Napolin and Isaac Bashevis Singer this weekend, with performances on Friday and Saturday evenings at 8:00 and Sunday afternoon at 2:00. Make reservations here. The Players will also resume their Theater for Children series with Rudyard Kipling’s The Jungle Book this Saturday at noon, with another performance the following Saturday at the same time. More information here. The Brookyn Heights Cinema will be showing The Grand Budapest Hotel and Le Week-End. More information and showtimes are here. Don’t forget the Grace Church Gala and silent auction this Saturday evening at 6:30. Looking ahead to next Wednesday, April 9, starting at noon Rabbi Seth Wax, of Congregation Mount Sinai, will conduct a pre-Passover program and demonstration sponsored by the Jewish Faculty and Staff Association of New York City College of Technology. There will be a “festive holiday program” and a glatt kosher “demonstration Passover seder luncheon.” This event, to which all are invited, will take place in the Grace Gallery, 11th Floor, 300 Jay Street. Admission is a suggested donation of $15. If you wish to attend, you must RSVP no later than Monday, April 7 to Albert Sherman (asherman@citytech.cuny.edu, 718-260-5837) or Allen Wolf, awolf@citytech.cuny.edu, 718-473-8910). Also this Saturday evening at 7pm at Saint Charles Borromeo Chruch on Sidney Place, Pat & Locke Wallace sing timeless songs of love and jazz by Hoagy Carmichael, Duke Ellington and Jimmy Van Heusen! Admission is $15 at the door.